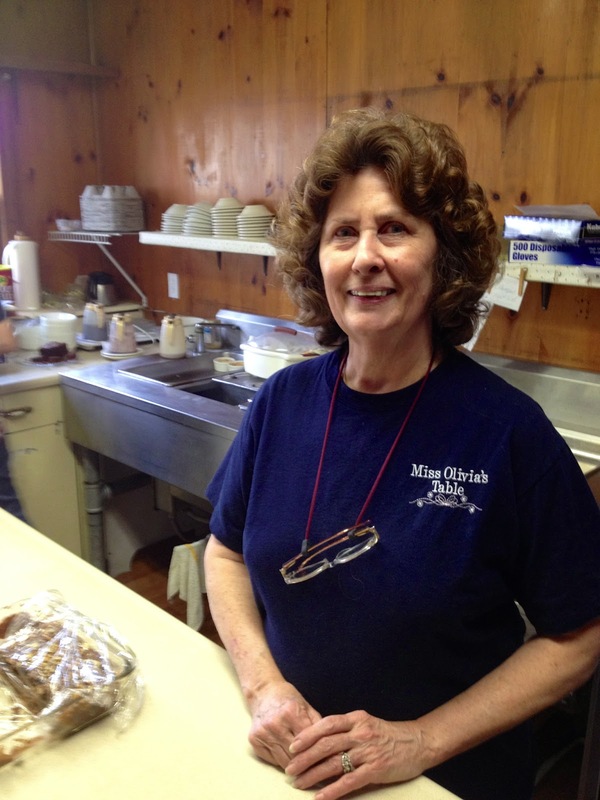 Miss Olivia doesn't tolerate dumb people or bad recipes, one reason her eponymous tea room in Maryville (pronounced Muryvl by the natives), Tennessee, is so popular. Another reason to love Miss Olivia, this long-time food writer and beloved local TV personality shares her recipes. Thus, I give you, Miss Olivia's extraordinary bread pudding. Hint: the secret's kin the bread for as Miss Olivia says, "stale bread, stale pudding." Mix well first five ingredients in large bowl. Soak croissants in the pudding mixture overnight in the refrigerator or for at least one hour (longer is better). Pour into whatever size baking dish (s) you prefer. Note: Miss Olivia uses "small or medium-sized doo-dazzlers (ramekins!). Place filled container in a water bath and cook at 350 degrees (f) until puffed and golden browns, 30 minutes or so. Bring sugar and water to a hard boil, stirring for exactly two minutes. Add whipping cream, boil one more minute without stirring. Add tsp. vanilla. 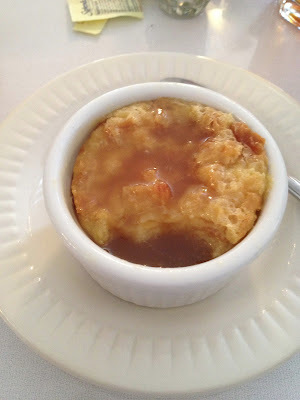 Labels: bread pudding, Maryville, Miss Olivia's, recipe, Tenn.
Winter days hover around freezing with nights in minus single and double-digits, yet residents of Quebec City embrace winter, holding the world's largest winter carnival. 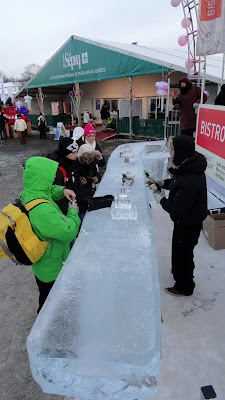 Thousands of outsiders, many from much warmer climes, join them in life-sized foosball games on ice, sleigh rides, hot tubs, white knuckle-fast toboggan runs, ice carving contests and spending nights on slabs of ice in Hotel de Glace. Drinking - but not hot caribous - from ice glasses is a winter tradition. All of that comes with rib-sticking treats like beaver tails, maple candy and a sure warmer, the Caribou. I found Quebec restaurateurs and chefs jealous guardians of their recipes, but one Quebecois shared his for the Caribou. The photograph isn't the best - no fancy stemware in the Bistro - and is a bit fuzzy - did I mention how cold it was? - but pretty is as good tastes and this tastes good. A steaming hot Caribou, just the ting for a cold night or day. 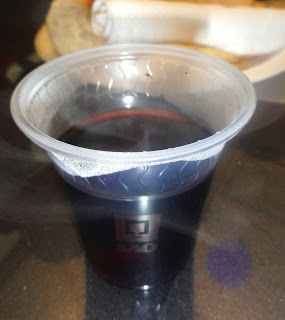 Mix two-thirds Merlot with one-third brandy. Heat, seasoning with star anise or cinnamon, to taste. Can also be served cold but I wouldn't recommend it during Quebec winters.